Don’t you just love soups that are simple and quick to make? Soups like this White Bean Soup, that are easy to prepare, nutritious and full of flavor, seem too good to be true 🙂 It is always welcome in my home to be prepared when pressed for time. This white bean soup is delicious and comforting. Enjoy! Heat the oil in a medium pot, add the onions and carrots, cook for 3 minutes, add the garlic and scallions and cook for 1 minute more. Add the beans, stock, cumin, salt and pepper. Cook for about 30 minutes over medium heat. Add the cilantro and cook for 5 minutes more. Transfer the soup to a blender and blend until smooth. Return to the pot and bring to a boil. Remove the pot from the heat and serve warm. « We Have a Winner! I like this! Especially the ‘easy’ part. I will be trying this soon! 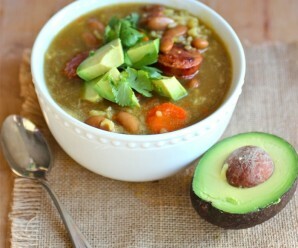 Erica this soup looks so good, can’t wait to try it, I think I’m going to use canary beans to make it! Yum! Yes, I do love soups that are simple and quick to make, as long as they taste good! I’m making this one tonight! (I’m not kidding) I was wondering what to have for supper without going out to buy anything. This is perfect and I have everything I need, even the bacon! Thanks! I love you pics too! I want to make this soup this week. I’m assuming the white beans are cannellini? It looks delicious. What a great soup! 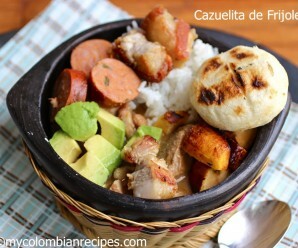 I have a nice jar of white beans I will soak up and cook to make this! Thank you everyone for visiting! Oooh, I love that piece of bacon on there! This bean soup looks so healthy and delicious! 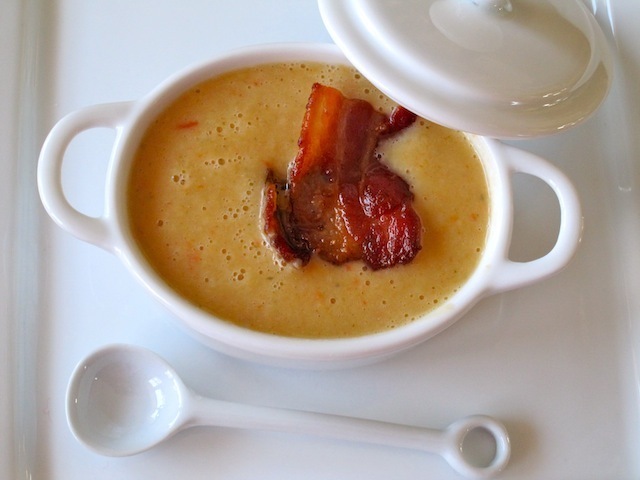 Your soup such a gorgeous color and the bacon garish looks incredible! Yum… sounds like a delicious soup. You definitely can’t go wrong with easy to make soups such as you white bean soup… and that bacon, it adds the mmm goodness in a soup all the time! Thank you for adding my site as one of the sites you follow. Im always thrilled when a blogger as big as you are do that! Thanks Mucho! oh I love this recipe! great soup…i am really enjoying your blog…I just started mine, please take a look. I pant to post once a week until I get better at it. I’m getting ready to make a white bean and garlic soup and was planning on garshing mine with bacon too:D It looks delicious Erica. Wonderful soup. Simple and Yumm! Thank you everyone for visiting my site! There is something so comforting about a big bowl of white bean soup. I like the sound of your version! Simply flawless! What an amazing looking and easy sounding soup. This looks like a great, easy soup and I love white beans! I can’t wait to try the recipe. This is an excellent and easy to prepare soup. Thank you, I’ve made it many times now – my husband loves it!! Erica, Thank you so much for this recipe. I made this soup with fresh white frijoles because I had them. I made this soup. While it was cooking, it smelled soooo wonderful. It tasted even better. 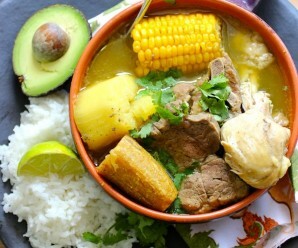 Made this tasty soup after having one at a Colombian restaurant. And it definitely was easy to make, especially with ingredients readily in grocery stores. I simmered with the lid off to thicken the soup. New to your site. 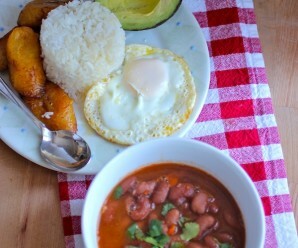 Can I use Navy beans for this recipe or what other kind of white bean is there?